Stepping into the workforce does not guarantee us the dream job or the expected working life we’ve been playing over and over again in our minds. We might be having plans for the perfect working life with a balance of work, fun and quality ‘me’ time but the harsh reality of the workforce doesn’t work that way. We would be faced with the 9-5pm schedule, the additional working hours, and the endless workload that by the end of the day, we do not have a so called ‘work-life balance’ or the quality rest time we wanted. It is time! Why not try freelancing? Freelancing has grown to be a large, competitive and expanding market in Malaysia. Freelancing offers different kinds of projects ranging from easy to more challenging corporate projects. Additionally, freelancers get to negotiate the best price for the job and work at their own free time. Freelancing is for people of all ages eager for the flexibility and its challenges. Explore your career opportunities being a freelancer by joining Favser today. Favser is a leading freelance platform in Malaysia which allows you to customise your professional profile to fit your expertise and for employers to have a chance to look for a suitable candidate for the job. Join the Favser family today! Still thinking? 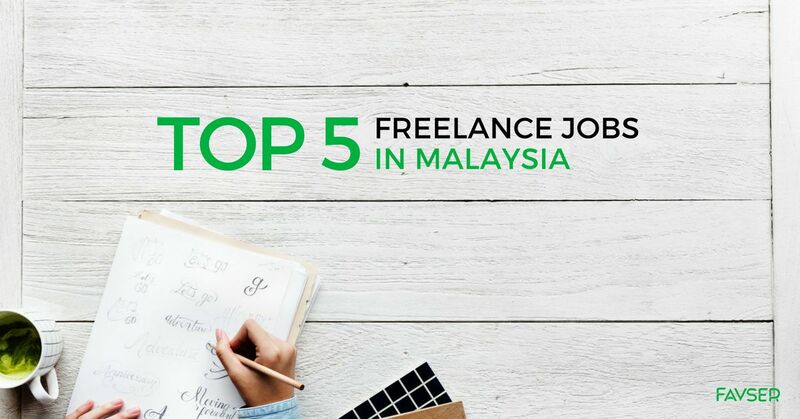 Here are the top five freelance jobs in Malaysia. Read through and you’ll see why Favser is such a golden opportunity in the expanding market and we’d love you to join us! People may have ideas but do not have the expertise to design it – be it a poster, logo or website. Most of us can create with free and less complicated applications on the internet but there is certain expertise such as Photoshop that requires professional services of a graphic designer. There are tonnes of graphic designing jobs in the market and freelance platforms and it’s a great opportunity to offer your services. Communication – Communication skills are of utmost importance when it comes to graphic designing. Graphic designers need to communicate and understand clients’needs and requirements in the project. Graphic design basics – Graphic designers need create aesthetically pleasing visual elements for the project given. The graphic design basics are fundamental when it comes to designing and it is important! These basic techniques such as balance, harmony, hierarchy and so on apply to designing when it comes to a project. Creativity – All jobs related to designing requires creativity. Creativity allows graphic designers to explore different aspects of design which will capture the eyes of audiences. Typography – When it comes to writing displayed in a designing project, different fonts can be functional. Take for example, if a tagline needs to be eye-catching, the font should be big, bold and clear. Colour theory – Colour has a huge impact on how users perceive something. Changing a colour of a poster from red to sky blue can create a different feeling and convey a totally different meaning. Being well-versed in colour theory can allow graphic designers to create the correct colour for the right emotions. Designing software – One should definitely know the right tools to use when it comes to designing. Two of the most popular software in the market is Adobe Photoshop and Sketch. Proficiency in at least one of the programs stated is essential to your work. Read more on additional skills needed to be a designer on Tips For Graphic Designer. A picture speaks a thousand words. Everyone can take a photo, but not everyone can take a photo that speaks life to it. A good visual will ensure that a product or business is attractive to the target group of customers. Hence, this is where photographers come in. Be it taking photos of food, architecture, products and even people; photographers should capture the essence of the message in the form of pictures and that is what makes it one of the top freelance jobs. Technical photography skills – A professional photographer should have excellent technical skills in photography such as handling photography equipment (cameras and lighting) and also photo editing software. Hand-eye coordination is also fundamental to obtain the best photos. Editing software – Photographers should be tech savvy with the proper software to edit the photos to make them alive and speak in volumes. Communication – A photographer should communicate well with the clients to capture photos that meet the expectations of those who hire you. Though communication, one can know exactly what the customers want from their photoshoot. Creativity – This particular skill is versatile for every job. Great photographers can know what to do with the lighting, composition and focus to capture and produce a great picture. Attention to details – A keen eye for detail is an ability to be praised in a photographer. This means one can capture the tiniest details when necessary and know when to edit it out. Legal documents familiarity – Photographers need to be knowledgeable with certain laws, particularly those relating to copyright and contract issues. Once I heard someone said that language is crazy! Indeed there are some truths to the statement made. Language is crazy in a sense that it is not all about conversing but it is the art of using words to bring about a message that speaks to different categories of people. The same word can convey a very different meaning. For example: ‘Tear’ could mean the droplets of water coming out from one’s eyes or it could mean shredding something like a piece of paper. The art of language is hard to muster and that is where businesses require the professional services of writers and translators. Writers and translators play a key role in mastering the art of crafting content to suit the needs of a project. It could be creative writing, scientific writing, advertising or website content. Communication – To be able to produce and craft good content, it is essential that writers and translators are able to communicate well with the respective clients. The project given may need to cater to certain target groups and different proficiency of language is needed in the writing. Proficient Language skills – As a freelance writer or translator, it is of pivotal to be proficient in your own native language. To be a very good freelancer, one would need to be equipped with excellent grammar and knowledge of different writing styles of the language used. In this way, the audience can be captured by the articles written. Researching good content – Freelancers should be able to know SEO trends and be able to search for relevant content for the project. The internet is a great source of information and with the proper content as the core; the message can be delivered to its readers. Creativity – Creativity will always remain a key point when it comes to writing and translating. With creative use of tenses and writing styles, one can not only bring out the original message but also give a touch of magic to the words. Time management – Freelance writers and translators have all the time in the world to produce good materials for the job. However, one still needs to manage time well to balance work and life. Good time management ensures that you can create great writings and also take on more jobs. Focus – To be a successful writer or translator, one would need to be focussed on the job. Everyone has their own timing where they can focus well, as well as having the right environment to boost concentration. Writing in cafes, or study spaces could help increase focus time. Editing and rewriting – There’s no denying it. No writer or translator can create the perfect article on the first draft. It takes many revisions and editing to perfect the right article for its purpose. Constant editing and rewriting will help you practice and with time, one can create their own style of writing with minimal errors. To improve as a writer read here Tips For Freelance Content Writer and 7 Skills Every Great Content Writer Needs or excel as a translator 8 Skills You Must Have to Succeed as a Freelance Translator—And How to Get Them. Website developing is one of the toughest jobs around the globe but there’s no denying that it has become one of the most wanted jobs currently. The world is moving towards technology and globalisation through the internet and websites are used to conduct businesses, interactive learning for students and so much more. There are platforms for instance Wix.com which enables people to create their own pages with the various templates but nothing beats a customised website developed for specific needs of a project. Website developers come in handy as they can create a website from scratch using coding and computer languages that normal people do not understand. They can develop the website to cater one’s preferences too ranging from the colour, fonts, language, interactive interfaces and so on. HTML/CSS – Hyper Text Markup Language (HTML) and Cascading Style Sheets (CSS) are languages that are essential in web development. HTML is a basic building block to create web pages while CSS is used to translate the HTML document into pages. Version control – Version control is the process of tracking and controlling the changes made to your source code while developing the web page. If you can track the changes, there is no need to start all over again if something goes wrong along the way. Responsive design – Nowadays, websites are not only viewed on laptops or computers but mostly on phones or tabs. A responsive design of a webpage allows adjustments to the size and interface of the device to ensure users get the best experience. Part-timers are such flexible jobs suitable for students, housewives and or any other individual looking for some extra cash. In Malaysia, most employers would offer part-time jobs for promoters for pop-up booths, retail stores, flyer girls/boys, and even roving promoters. There are also job opportunities for sales assistants for all kinds of businesses. Self- management – Self-management are skills referring to those that are related to being a reliable and trustworthy employee. Take an example, being punctual for a job shows that one is responsible and committed. Communication – Being able to communicate means that one is able to listen, understand and express oneself in a poised manner and being able to share opinions with each other. A person’s ability to communicate with clients, co-workers and employers ensures a better working environment. Self-motivation – Being motivated at work shows that one is keen in the job offered. This gives a good impression to employers and at the same time one can find joy and pleasure in work. Self-motivation also allows one to think out of the box to find creativity and innovation at work. Time-management – Time is essential. If one can manage his/her own time well, there is always enough to handle the workload and also have fun! Good time management also ensures freelancers to be able to take up more jobs. Working under pressure – When the going gets tough, the tough gets going. Working under immense pressure is a key skill to increase one’s employability. Workplaces are hectic, so it is important that we can work under pressure and produce quality services in the related fields. Truth be told, there is no job that does not require great communication. Communicative skills are the basis to understand and meet the needs of a project. A pleasant conversation with clients conveys confidence, commitment, self-motivation and a good first impression. Who knows? Perhaps one may have the chance to obtain more job opportunities. While technical skills maintains as the core of a freelancer in any field, one could never afford to lose a little ‘magic’ – passion! Your passion and enthusiasm in your work shows self-motivation and commitment to the tasks at hand. A passionate worker gains the extra bit of trust from a client and they do really believe they hired the right person for the job! Lastly, a freelancer should have excellent time-management. Freelancing is all about juggling between different projects with its various requirements and meeting customers’ datelines. Managing your time wisely for each job ensures you the best of both areas – having a work-life balance. Join the Favser family today! It will only take you 10 minutes and you’re on your way to work at your own creativity and freedom! This article is written by Tan Xin Yi, a registered freelance writer on Favser.com.